When is a sport not a sport? When it's on ESPN and you're rooting for vomit. | American McCarver. Your Sports Blog. Of all the stupid things we are going to watch on tv today, we will watch the Nathan's Hot Dog eating competition on ESPN. Granted, it will only take about ten minutes of our time, but I feel like I'll need to do penance for those minutes. ESPN is a sports channel, right? I really don’t mind eating competitions as a whole. I did venture to Coney Island once on the Fourth of July to get a glimpse of the hot dog eating contest, but that was mostly just to say I did it. And to avoid a family gathering. There are plenty of people out there who hate the contests because they promote gluttony and flaunt the excess of Americans and waste food in the face of world starvation and that’s why the terrorists hate us. Not for nothing, but there are millions of homeless people in America and that doesn’t stop me from adding unnecessary luxuries to my home, so the idea of hungry kids in Indonesia is not going to stop me from watching some guy shove back 40 hot dogs in thirty seconds. So why will I watch this today? Why do I ever watch any of these competitions? Why do I watch Toddlers & Tiaras? Sheer curiosity, I guess. I watch it in the same way one watches a freak show; you want to be disgusted by the bearded lady or the dog faced boy, but instead you are somewhat enthralled. Sure, you leave the freak tent feeling like you need to take a Silkwood shower for having participated in that form of culture, but it's still entertainment. Which is much like I feel every year after watching the Nathan's competitors eating their food. While I’ve seen competitions like this before, I never really watched long enough to get the close up view I did when I once watched a Krystal Burger eating championship on, yes, ESPN. The sports channel. See, ESPN isn't just for sports. It's for education, too. Before I watched that I had no idea the contestants dunked their food in drinks. The guy I picked as my favorite, the mowhawked Pat Bertoletti, was using some blood red fruit punch to soak his burgers. According to my boyfriends, who knows way too much about competitive eating, they soak the food to take the air out of the bread, thus making it easier to get down. First let’s establish that the thought of eating even ONE Krystal burger is enough to nauseate me. I’ve never had one, but they seem enough like White Castle burgers for me to take one look at a plate of them and have flashbacks to being absurdly drunk at 3am and making a bet that I could eat 25 sliders and ending up covered in vodka and burger vomit. So right away, I’m disgusted by this competition. I might have been ok with it if it weren’t for the close ups. That’s when I got the real view of what these people are doing. Pat would dunk a burger into the red drink, squeeze it with his fist, then practically shove his whole fist into his mouth to stuff the dripping, soggy, red-tinged burger in there. I focused on Pat because of the color of his drink. For a second, it looked like he was a cannibal devouring a blood-soaked victim and I thought “hey, cool!”, until I saw all that water logged bread and meat dripping out of his mouth and squishing through his fingers. Worse than that was the dreadlocked guy whose burger bits got caught in his hair, or the old guy, because nothing is more disgusting than an old person with a face full of chewed up food. The thing about this competition is it separates itself from all other "athletic" endeavors in that it's the only "sporting" event where I keep waiting for someone to vomit. That, by the way, is against the rules and referred to as a Reversal of Fortune. I'm hoping if anyone reverses their fortune today, it will be someone who dunks their hot dogs in fruit punch, because that blood red puke would rival the pea soup scene from the Exorcist. This is better than any dog faced boy. I'm rooting for a vomitorium, begging the God of Excess to unleash his brand of karma upon the entire IFOCE, and have everyone, from the eaters to the scorecard chicks to the little kids in the front row covered with ten different colors of chunky hot dog puke. When it is all over, I will chide myself for watching something so depraved, so revolting, so sickening. Then I'll eat hot dogs at a bbq at my father's house while being forced to watch the Mets play, so your mileage of what is revolting may vary. Either way, I'd like to thank ESPN for broadening the definition of sports to the point where holding in your vomit while sucking down wieners will probably get more ratings than a regular season NHL game. And yea, I'm rooting for Sonya. 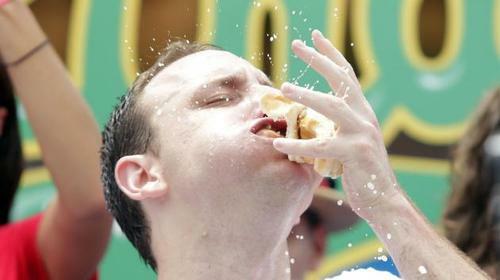 Or maybe I'm rooting for Joey Chestnut to implode.